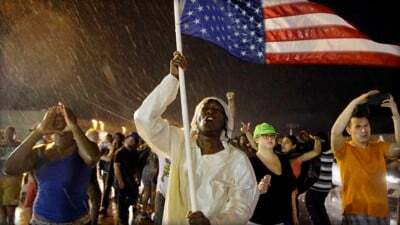 St. Louis County Executive Steve Stenger declared a state of emergency Monday as protests marking the anniversary of the police murder of Michael Brown intensified after officers shot 18-year-old Tyrone Harris Sunday night. The circumstances surrounding Harris’s shooting remain unclear, but it is known that four plainclothes police officers shot him multiple times near a demonstration taking place on West Florissant Street in Ferguson, Missouri. Harris remains in critical condition after undergoing surgery following the shooting. So far, over 100 people have been arrested in the St. Louis region since Sunday night, while heavily armed police officers have descended upon the area, dispersing demonstrators with tear gas and rubber bullets. Stenger said that the declaration of the state of emergency was necessary to prevent “the potential for harm to persons and property” in the area. “The recent acts of violence will not be tolerated,” he added. In fact, the demonstrators remained largely peaceful, and any violence was attributable to the police. The declaration of such preemptive states of emergency, citing only the hypothetical possibility of violence, has become increasingly common in the United States. The announcement echoed last year’s preemptive declaration of a state of emergency by Missouri Governor Jay Nixon, in anticipation of the November 25 grand jury decision not to bring charges against Brown’s killer, Darren Wilson. Nixon simultaneously mobilized the National Guard, which carried out mass arrests of demonstrators. Also on Monday, the Washington Post revealed that one of its reporters, Wesley Lowery, has been charged with trespassing and interfering with a police officer following his arrest on trumped-up charges during demonstrations last year. Lowery, who has been ordered to appear in a St. Louis County municipal court August 24, was one of over a dozen journalists arrested for documenting the police suppression of protests in Ferguson over the past year. Stenger declared the state of emergency less than an hour before 57 protesters were arrested during a demonstration in front of the St. Louis County Federal Courthouse. Significantly, the peaceful protesters were arrested by officers from the Department of Homeland Security, underscoring the collusion of the federal secret services with local police forces. St. Louis County police chief Jon Belmar has been placed in charge of police in Ferguson during the state of emergency. Tyrone Harris was shot at around 11:15 p.m. Sunday in the arm, legs, back, chest, liver and groin and taken to Barnes Jewish Hospital, where his family was later denied entry. The official story given by police of what led them to shoot Harris has come under intense scrutiny from the youth’s family. His father, Tyrone Harris Sr., maintains that his son was unarmed, calling the police story “a bunch of lies.” He also revealed that his son was close friends with Michael Brown, and was present at the protests in commemoration of his death. Harris Sr. says that two witnesses who were with his son told him that he was unarmed and had merely been drawn into a dispute between two groups of young people. The two witnesses told Harris Sr. that his son was “running for his life” when police shot at him eight to 12 times, eerily similar to the manner in which the unarmed Brown was killed by officer Darren Wilson last year. Harris’s girlfriend, Qunesha Coley, told the Washington Post that she and Harris went to Ferguson to commemorate Brown’s death, and upon arriving they met up with some friends who had stolen a television. Coley says that when they tried to sell the TV to another group of young men, that group instead started shooting, at which point Harris and Coley began to flee. Belmar claimed at a news conference early Monday morning that Harris Jr. was armed and among an estimated six people who exchanged gunfire late Sunday evening near the protest. He alleged that Harris then attempted to flee and was followed by an unmarked vehicle carrying four plainclothes officers, at which point he opened fire on the vehicle. Belmar said that the four officers then chased Harris on foot, and only opened fire after he allegedly shot at them again. None of the officers suffered injuries during the supposed exchange of fire. Conveniently, none of the officers involved in the shooting were wearing body cameras and there was no dash camera in the unmarked car. St. Louis County prosecutors Monday announced 10 felony charges against Harris, including four counts of first-degree assault on a law enforcement officer, five counts of armed criminal action and one count of shooting a firearm at a motor vehicle. His bond was set at $250,000. All four officers that shot Harris have been placed on paid administrative leave. The majority of officers confronting demonstrators donned body armor, and were backed by numerous Mine-Resistant Ambush Protected tanks and other military equipment. Immediately after the shooting of Harris, police forcibly dispersed the remaining protesters by saturating the area with tear gas and smoke. The brutal police crackdown on demonstrators contrasted starkly with the peaceful memorial marches that had taken place on Sunday. Over 1,000 people, coming from across the US, gathered at the site of Brown’s death in the Canfield Green apartment complex at around noon. They embarked on a 1.5-mile “silent march” up West Florissant Avenue with Brown’s family. Roughly 300 people gathered inside Greater St. Mark Family Church and observed 4 and a half minutes of silence, symbolizing the 4 and a half hours Brown’s body was left lying in the street after being shot to death. Erica Garner, the daughter of Eric Garner, who was choked to death last year in Staten Island, New York, spoke at the church. Relatives of Oscar Grant, another youth murdered by police in 2009 in Oakland, California, were also in attendance. Solidarity demonstrations took place in cities across the US Sunday, including in New York City, Pittsburgh, Denver, Olympia, Washington, St. Petersburg, Florida, Cambridge, Massachusetts, Ypsilanti, Michigan, and at the Waller County Jail in Hempstead, Texas, where Sandra Bland was found dead last month. In London, protesters gathered outside the American Embassy. Numerous other demonstrations are planned throughout the week. In the year since Michael Brown was killed on August 9, at least 1,159 people have been killed by police in the US. The Obama administration has done everything in its power to ensure that killer cops are shielded from prosecution. The Justice Department completed the whitewash of the murder of Michael Brown last March by failing to bring federal civil rights charges against Wilson, affirming the de facto right of police to murder with impunity. Behind the backs of the population, the Obama administration has continued to funnel billions of dollars in military equipment to local police forces, including the armored vehicles and assault rifles that are once again on display in Ferguson.